Ancestral Quest includes a feature which allows you to see information from ancestry.com when you are in the pedigree view. Before using this feature, information in the pedigree view looks like this. To use this feature, click on the View tab on the menu bar and select Ancestry.com Links. After making this selection, the same section of the pedigree view looks like this. One slight disadvantage of this feature is that it may cause names to be abbreviated. The original advantage of this feature was that it would give you a link from Ancestral Quest to ancestry.com’s information about each person on the pedigree view. Ancestry.com was sold, and the new owners apparently do not find it necessary to honor the original agreement with AQ. As a result, Gaylon Findlay is asking users of Ancestral Quest to tell him whether they think this feature should be removed. His request was posted on the AncestralQuest newsgroup in Yahoo. This is what he said. Ancestral Quest has a feature that was jointly designed by Incline Software and Ancestry.com back in 2001. It has been used by many AQ users over the years to great advantage. I need to learn from those who use it, whether it still has value. Part 1) If you are on AQ’s Pedigree view, and activate the “Ancestry.com Links” from AQ’s “View” menu, then AQ will search Ancestry.com for each person whose name appears on the Pedigree view, this is 31 names if all names are filled in. Ancestry.com will send back to AQ the number of compiled trees that have been uploaded to Ancestry.com, and the number of other records, such as Census Records, Social Security Death Index, Military Records, etc., for each name. AQ will then display the number of trees and the number of other records that you might expect to find in Ancestry.com for each person on your Pedigree screen. Part 2) If you click on the number of trees, AQ then pops up an options box. You are given the choice to either do a general search for the trees on WorldConnect (where the public gets free access to the trees that were donated to RootsWeb), or to follow a direct link to the records that Ancestry.com has already identified. If you click on the number of other records, AQ again pops up the options box, giving you the choice of doing a general search for records on Ancestry.com, or of following a direct link to the records that Ancestry.com has already identified. In order for this feature to work, it requires AQ to do its part, and it also requires that Ancestry.com do its part. To date, AQ still does its part of this feature. However, Ancestry.com has made some changes, and as a result, parts of this feature still work and other parts do not. 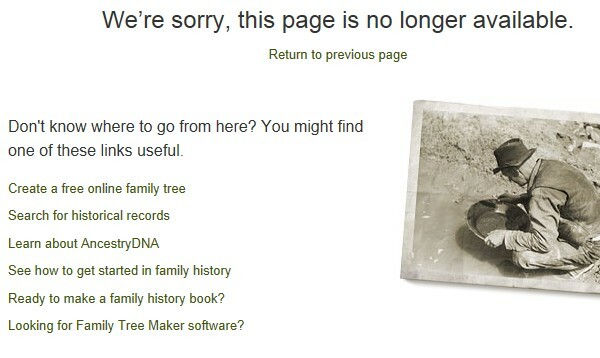 Ancestry.com has told us that they no longer support this feature, so if our users find value in it, that’s great, but they have no commitment to keep this feature working. Part 1 still seems to work. I believe that Ancestry.com still sends a valid count of trees and other records for display on AQ’s Pedigree screen. If you use the “General Search” option in part 2, this still works, and I see no reason why it would ever stop working. However, the direct links in part 2 require that you are a subscriber to Ancestry.com, and have stopped working sometime in 2011. We found a work-around that allowed some users to continue to use these direct links. The last time I tried to use the direct links myself, I found that they worked from my 32 bit Vista machine, but they didn’t work from my 64 bit Windows 7 machine. That was a few months ago. Today, I can no longer get these direct links to work even from my 32 bit Vista machine. I know that some on this AncestralQuest newsgroup have used these direct links, and even since 2011 have found a work-around to continue to benefit from them. Could those of you who have used the direct links contact me, and let me know (gfindlay@ancquest.com) whether the direct links still work for you, or whether the direct links no longer work? If Ancestry.com has completely disabled the direct links, then we need to remove this option in AQ. When I tested this feature this morning, I was able to reach ancestry.com while using the general search for trees and the general search for records. When I tried the Direct Links for each, I got this sorry message from ancestry.com. If you are somehow able to make this feature work, and you would like to have it remain in Ancestral Quest, you should contact Gaylon. If you have tried it and found, as I have, that it doesn’t work, then please let Gaylon know, so that he can remove the Direct Links feature. As always, a great post! Thanks for the info and details. As for what I think about the issue…I don’t know…I seldom used it before it became a problem. I think I’d rather have Gaylon spend his time on other issues, especially if that’s the way ancestry.com is going to act….